a while back I was listening to the Area channel (now called Electric Area – personally I preferred the name Area) on SIRIUS|XM radio. A segment called the Yoshitoshi Show came on by a DJ named Sharam that I had never heard of… and I was pretty much blown away by how much this guy’s style matches with my own tastes in electronic music! Turns out I shouldn’t have been surprised, as Sharam is Sharam Tayebi, half of the DJ duo Deep Dish, and Deep Dish I was quite familiar with (though obviously not familiar enough to recognize the name Sharam when I first saw it), because they are awesome! 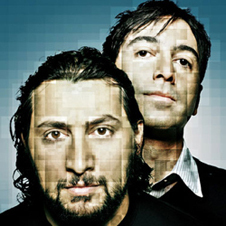 Sharam’s mixes are available for free online at SHARAM, his official website. They are all quite deep, featuring tunes with some excellent drum machine work and catchy vibes. Two of my favorites are Wildcast 23 and Wildcast 21. Wildcast 23 is the podcast I first heard in my car, and what an intro to Sharam’s mixes – some great progressive house tunes capped off by Chemical Brothers and Underworld! Meanwhile, Wildcast 21 features a mix of grooves by a variety of artists who, for the most part, I have never heard of, but together they form a great mix.